The argument has been made that Cubs fans aren't really that dedicated, that they're mostly a bunch of yuppies who turn Wrigley Field into the world's largest outdoor saloon, and that they couldn't tell you the right-fielder's name or what the score is. 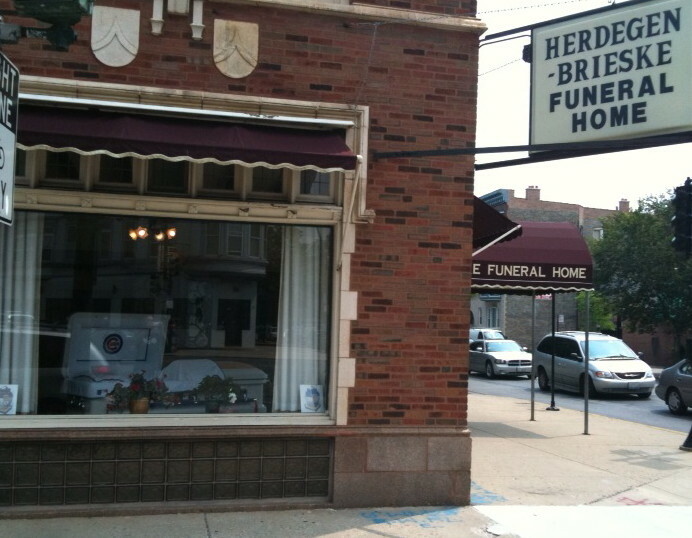 But when you want to get buried in a Cubs-themed casket or have your ashes placed in a Cubs urn, that's saying something. I was picking my daughter up from camp the other day on the North Side of Chicago when I saw this about a mile from Wrigley. I know this trend is hot among fans of college football powers, too, so it's definitely not exclusive to the Cubs. But I enjoyed seeing it while traversing the North Side. Personally, I don't think I'll go that route... not because I think it's over the top - I don't. If someone spent a good deal of their life cheering for and agonizing over the Cubs, then why not show it on the way out, too. I'm just somewhat clautrophobic and can't imagine being put in a box underground. And the ashes-in-the-urn thing I can't really think about right now, either. Maybe what I'd really like is for my friends and relevatives to take me to a game at Wrigley and prop me up in the bleachers... kind of a like a Weekend at Bernie's for Wrigleyville. Then they could carry me over to the Gingerman Tavern after the game, set me up on a bar stool, order me a Bell's Oberon and just leave me there. Yea, that's it.